This course is combination of 1-day Libraries and 1-day Schematics course. Each day can stand by itself without any dependency of each other from the exercise perspective. The first day libraries course teaches you how to create basic schematic component libraries (.SchLib) and associated printed circuit board footprint libraries (.PcbLib). You will also learn how to create Library Projects (.LibPkg), Integrated Libraries (.IntLib) and Database Libraries (.DbLib). You will progress through a standard component creation flow, as they are introduced to the various available workspace panels and dialog boxes to facilitate component creation. The example project used in this course (Developer Tool – DT01) is available from the same example projects folder included with the Altium Designer installation. You will be introduced to the available workspace panels related to the schematic library editor. You will examine the different preferences used to configure components and then work through the creation of new schematic symbols. Similarly, the same process will be followed to acquaint you with how to create PCB footprints. Many tips and tricks will be presented throughout the course to give you the information you need that can only be gained through years of experience with the tool. 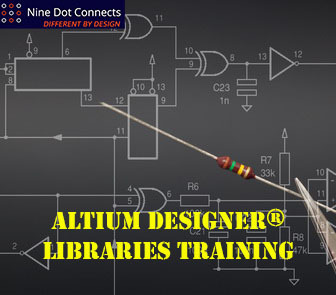 At the conclusion of the day one of the libraries course, you will have a good understanding the types of libraries offered in Altium Designer and their configurations, in addition to component creation. 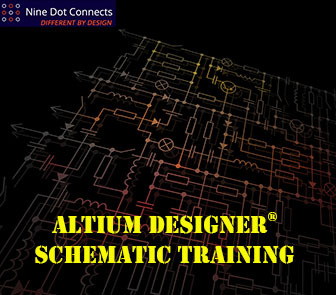 The second day schematics training was designed to show you the ins and outs of the Altium Designer schematic editor. This includes placing schematic components from various libraries sources into the schematic editor, connecting the components throughout the schematics through various nets, netlabels and ports primitives, and checking the design for errors and warnings. The second day concludes with a study of how repeated circuitry is implemented in Altium Designer (also known as multi-channel design) and introduces you to the self-study resources available for simulation and signal integrity tools in Altium Designer. You will be provided with a Libraries & Schematic training manual (246-pages). "We had three days of some of the best training I can remember in my career. Chip handled all questions and maintained a formidable pace that covered a lot of territory and yet made sure no one got left behind. I have received a number of positive comments from the attendees. Things like “I wish I had had this training 3 years ago!” or “spent days trying to figure this out and it can be done on just a few clicks!” All in all it was a very valuable experience."